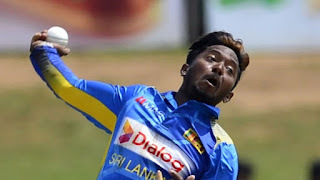 Sri Lankan spinner Akhila Dhanjaya will fly to Chennai today to reassess his bowling action after corrective measures, Sri Lanka Cricket sources said. Dhananjaya was recently suspended from bowling by the ICC as his bowling action was deemed illegal. The Sri Lankan spinner will undergo an assessment at the Sri Ramachandra Institute of Research and Education. After initial assessments at the Sri Ramachandra Institute, Dhananjaya's bowling action will be scrutinized by the ICC again, our sources said. They expressed optimism that Dhananjaya, Sri Lanka's main spinner in recent matches, will be able to make a comeback before the ICC World Cup in 2019. Dhananjaya has got 46 wickets in 30 ODI at an average of 26.93.